Recently I've come across this beautiful short film about a lovely cat called Mog on YouTube. 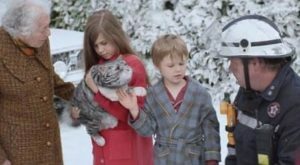 It was made in November 2015 for the 2015 Christmas advert for the British supermarket chain Sainsbury's and was titled «Mog's Christmas Calamity». I absolutely adore this short film which was inspired by the book written by the children's writer Judith Kerr. Mog is the main character in this series of books. Other characters are Mr and Mrs Thomas who are Mog's owners and their two children Nicky and Debbie. Unusually for a popular children's series, Mog dies in the final book, 2002's «Goodbye, Mog». Kerr based her illustrations of the house in which the family live on her own family home in Barnes, London, and the two children were named after the middle names of her own son and daughter, Matthew and Tacy. The family name «Thomas» is from the first name of her husband, NigelKneale, upon whom the appearance of Mr Thomas was based. In «Mog's Christmas Calamity» Mog accidentally started a fire in her home after having a bad dream. Nevertheless, she was able to alert the fire brigade as she had called 999 when scrabbling across a phone. Everyone considered her to be a hero because she saved her owners. And after her owners' neighbours had pooled their resources to undo the damage she had done, in reference to Sainsbury's «Christmas is for sharing» tagline, she was later given an egg as a treat. Kerr herself appeared in the advert as a neighbour of the Thomas family. 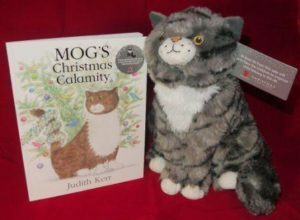 A special plush Mog and book version of the story were sold exclusively through Sainsbury's, with all profits being donated to Save the Children's child literacy work. You can use this wonderfulshort film advert in your classes with young learners, teens and adults as well while studying about Christmas traditions. Use flashcards to elicit Christmas vocabulary. Ask the studentds to describe Christmas traditions in their country (family) or in the English speaking countries. Spot the differences in celebrating Christmas in their country (for example, in Russia people celebrate Christmas on January 7th) and in other countries. You can read about Christmas celebrations in Russia here. Tell the students that they are going to watch a short film about a fat cat called Mog who cuased lots of calamities which ruined a perfectly prepared Christmas. Put students in pairs and ask them to predict what Mog might do to ruin Christmas Day. Remember that you should limit the time for your students (up to 5 minutes) to come up with the ideas. Tell the students to watch the film and compare their predictions with the real events in the film. Stop the film at the caption «Christmas is for sharing». Ask the students how they understand this message and give their own examples of how we can share at Christmas. It was Christmas Eve and everyone in the Thomas family was dreaming sweet dreams. Nicki and Debbi were dreaming about what Santa would bring them; Mr Thomas was dreaming of a new bat; Mrs Thomas was dreaming of... «Oh, Captain Thomas!» ...something else. Finally, of course, we have Mog. Mog was not dreaming sweet dreams, Mog was having a nightmare. 2:21 : As the neighbours gathered, the fireman told everyone how Mog had saved the day. But there was no egg for Mog. There was no Christmas at all. At least, that's what they thought... but everyone else thought: if the Thomas's and Mog can't have a Christmas, they can share ours. So that's exactly what they all did. Эта запись написана автором Елена Шрамкова, 24.12.2017 в 03:18, и размещена в категории Christmas Time. Следите за ответами на эту запись с помощью RSS 2.0. Вы можете написать комментарий или разместить обратную ссылку на своем сайте.